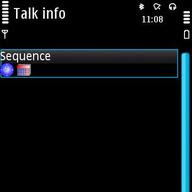 Talk info say the Time, Day and Date, Battery Level, Active Profile in sequence. Launch once to get time, twice to get day and date, and so on. Built-in Text-To-Speech required. Key Feature : * Say time, day and date, battery level, active profile in sequence * Configurable sequences * Up to 2 (two) sequences.